“Right from the start of the planning, we had agreed that we really wanted to have our wedding in Wales. I was really lucky to find Rosedew Farm, in Llantwit Major, Vale of Glamorgan; I scoured the internet and managed to get in touch with Gaynor the owner. I have to say that Gaynor was one of the most wonderful people we could have had involved in our wedding. She was so encouraging, always excited at our ideas and nothing was ever too much hassle. The inspiration for the decor and the overall look of the wedding came from lots of wedding blogs celebrating people doing things differently and this really gave me the confidence to go with my heart. There was definitely a shabby chic, village fete, vintage tea-party style which just fitted in so well with the venue. We also wanted to incorporate our big love of rock music and so we spent ages choosing the music for the whole day, picked our favourite albums as our table names, we had a live band playing great rock ‘n’ roll covers in the evening and Gordon (who is a drummer) performed with his friends as an amazing Elvis tribute band, fronted by Richard T King! The involvement and help that we got from so many people meant so much to us, and not only did it take some of the pressure off us, it meant that we truly shared the day with all our most loved friends and family. My mum was a true star – she made 100s of metres of bunting, all made from fabrics chosen to set the palette of the day, and to match my dress!! She also did all the flowers, made little pots of jam for our favours, and her and my Dad came up for a week before to help decorate the venue! So many other people got involved: My friend Alice made the amazing cakes, Gordon’s Dad made a beautiful cake stand, Richey Beckett did all the original illustrations and layouts for our invitations and stationery, many friends from my world of theatre work donated lighting and sound equipment, props and dressing and we even had friends who came and decorated the rather uninspiring toilet block to look like a big hedge with fake grass and picket fence, with the ladies as a homage to all my favourite plays and musicals, and the gents as a shrine to Gordon’s bands! The food was a really important part of the day to us as we really love trying different cuisines and sharing good meals with friends. We worked hard to get exactly what we wanted – a mexican feast – and it made such a great occasion of the meal. 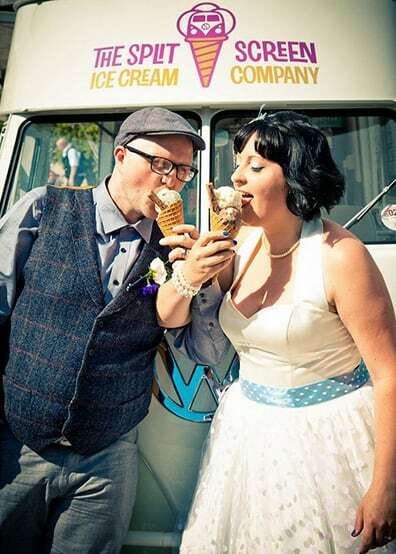 For dessert we organised to have a Vintage VW Camper Ice Cream van – from the amazing people at Splitscreen Ice Cream. This was one of the highlights of the day for everyone, it was so much fun and the ice cream was just delicious! After that, we had an afternoon of Sports Day games – egg and spoon, three-legged race, fancy dress race, tug-o-war – that was an absolute blast! Everyone got involved, let their hair down, took off their wedding shoes and revealed their competitive side! We even had rosettes for the winners that I had had made especially in the colours of the day. My wedding dress was quite a worry at the start of the process. I’m quite short (and never wear heels!) and not particularly slim, so I knew straight away I was never going to conform to any traditional idea of what to wear. I visited only 3 high street wedding dress stores in one day with my Mum and just felt totally uninspired. I saw some great short-length vintage-inspired dresses in photos online, but found absolutely nothing similar in the shops. To top it off, many that I did try on were such tiny sizes that I couldn’t fit in them properly and looked ridiculous. Or I was laced in to the point of suffocation, just so the attendants thought I looked thinner. As if anyone wants to spend a whole day dressed like that! I found the whole idea ridiculous, and was never going to push myself to go on a wedding diet just because thats what other people do. I wanted to be comfortable, to be able to eat some of the amazing food we had spent a long time choosing, and to move my arms away from my sides to dance and hug all my guests! I eventually came across Honeypie Boutique online, who had a fantastic range of 50/60s style dresses in all sorts of different cuts, and I was so elated when they agreed to put a polka-dot overlay on the skirt. I also customised the dress, choosing a blue petticoat also from Honeypie Boutique and I made a matching blue waistband myself with ribbon and polka-dot voile, which I also got made into a little bolero. I found the perfect shoes with a teeny heel and made some blue polka-dot bows and Mary-Jane straps. This all took time but I loved doing it and I’m the sort of person who, once they have an idea, just has to see it through. I also accessorised the outfit with the most stunning birdcage hairpiece, designed by Claire Hill at the Rachel Burgess Bridal Boutique in Penarth, near Cardiff. This is the most amazing Bridal shop in the world, it had only just opened when I got my dress but I’m so glad I got to include something from their collection in my outfit. I had thought of having a birdcage veil to fit in with the 50s style and when I saw this one with little birds on it I just fell in love!! Claire even added some blue feathers to tie in with the colour scheme. So it means I got exactly the outfit I wanted even though it didn’t already exist in any shop. It was amazing on the day to know that what I was wearing was totally unique and had come from my own ideas. The blue polka-dot theme really came into play with my sister’s Bridesmaid dress. I had been thinking ‘can I really have a polka dot bridesmaid? !’and was so happy when Helen said she loved the idea! We got the dress made by Louise at Oh My Honey, who was brilliant and was happy to make a different style of dress in the fabric we found on her website. Gordon also broke the rules – never seen in a suit in his life, so it was never going to be top hat and tails for him! We found a lovely tweed waistcoat and matched some grey trousers and shirt with a white tie and braces and it just looked so cool! He always wears a hat, so he chose a grey flat cap and it all worked so well together. The music and dancing went on late and we’ve had so much positive response from people who said its the best wedding they’ve ever been to! I learned so much in the journey of planning this wedding. So much of its success as a day was down to the involvement of my wonderful friends and family. I always knew I would never have a cut-and-paste wedding but my advice for anyone thinking of doing the same thing is delegate!! People love to be involved, to feel like they are making a difference to your day so take up the offers! My one regret is that I left too much of the details of the day in my own head and it meant I was rushing around in the afternoon getting things ready, rather than sitting down with my guests and a glass of wine in the sun! Get a good photographer. I was lucky to know Simon Gough from the theatre world, and he has given us one of the greatest gifts which is a catalogue of beautiful photographs to remember our day. Neither of us were very keen on posing for photos but his creative eye just captured the location, the venue and the happiness of the day in us and our guests, its priceless! We love how Katy & Gordon got married EXACTLY how they wanted to and included so many personal details that was so important to them! What a beautiful wedding.